Explore the beautiful fishing town of Santa Margherita Ligure, home to both a sixteenth century castle and the Basilica of St. Margaret of Antiochia. We took a ferry between cities (Portofino, Santa Margherita, Rapollo), doing a walking tour of each, with a bit of time to enjoy a cappuccino or for some shopping. A nice day! Everything about Italy was beautiful. 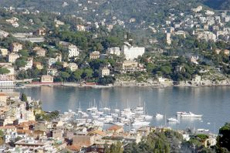 We booked the Portofino-Santa Margherita Ligure combo.